The ruling right-wing Liberal party on Sunday went public with a new refugee policy, setting it on a collision course with the coalition Labour party, the Volkskrant reports. The seven-page document, drawn up by MP Malik Azmani, states that Europe should drop its refugee policy and close its borders. Refugees should be provided with safe accommodation in their own region where they will be able to build a new life, possibly with European help. ‘This is the message the new asylum affairs minister should take to Brussels,’ Azmani is quoted as saying by broadcaster Nos. The Labour party, which forms a coalition together with the VVD, is not prepared to work on pursuing this policy and considers the plan ‘unrealistic’, the Volkskrant says. Party leader Diederik Samsom said on Facebook on Sunday evening the plan is ‘totally unacceptable’. Sources within the Labour party told the Volkskrant the plan has no chance of success and there is no majority in favour within the Dutch parliament. They also raised the question of how far the VVD is prepared to push the issue. The NRC’s chief political correspondent René Moerland said it is difficult to judge what the party hopes to achieve and that the timing, so close to the provincial elections, is interesting. Azmani says the number of asylum seekers in Europe soared by 191,000 last year to 626,000. ‘The European migration system cannot be sustained and forms a major risk to our security,’ he is quoted as saying by the Volkskrant. Current refugee policy aids people traffickers and the money they demand from asylum seekers is often used to fund armed struggle against the west, Azmani said. In addition, it is difficult to differentiate between real refugees, economic migrants and terrorists, the VVD document states. It is unclear from the media coverage what the status of the document has within the VVD and if it is supported by ministers, including the new justice ministry team. 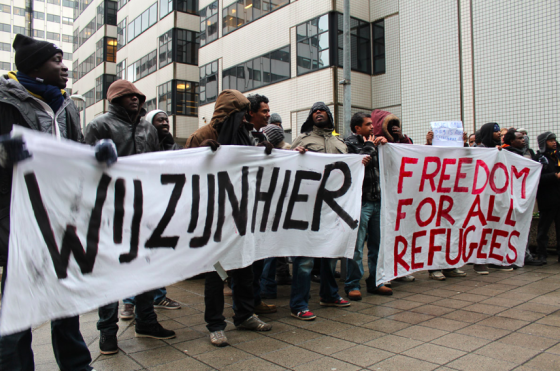 Refugee organisation Vluchtelingenwerk says 97% of refugees are currently looked after in their own region.